At least on the surface, the main curiosity about this Aïda is the presence of Robert Wilson as the stage director, as well as the set and lighting designer. Wilson, at one time almost solely associated with more experimental dramatic works (Philip Glass's operas, for example), lately has been making a name for himself in the more traditional repertoire. A recent production from The Netherlands of Madama Butterfly (Opus Arte OA0937D), for example, was surprisingly effective. Shorn of what some might call superficial japanoiserie and reduced to lighting and gestures, Puccini's drama made a powerful impact. Predictably, this Aïda is similarly stripped of pretty spectacle – in the Triumphal Scene, don't expect lots of color, let alone horses or elephants! 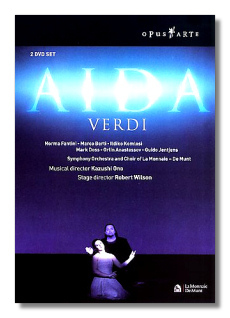 However, to state the obvious, Aïda is not Madama Butterfly, and I am not sure that Verdi's opera is amenable to "Wilsonizing," if you will. The tension between public responsibilities and private needs is what Aïda is all about, and Wilson's production deals almost entirely with things that are private. Also, the stylized gestures that seemed appropriate in Butterfly seem less so in his Aïda. This time around, I think the singers were less convinced. I rather suspect that Wilson was less convinced too. In his Butterfly, one felt that he cared about the characters. I don't feel that way about his Aïda, at least not as much. Visually, there's still much that is impressive and interesting about this production. Wilson uses lighting as if it were another character, and he creates some imposing (yet static) stage pictures. The costuming is not very complimentary, though, and the garb of some of the extras and chorus members suggests the phrase, "Is that a pyramid in your pants, or are you just happy to see me?" The cast is lacking in big names, but there's excellent musicianship here. Norma Fantini is an Aïda in the style of Tebaldi, able to give the music its necessary weight, yet still capable of lightening her voice and spinning out some exquisite soft, high notes, especially in the Tomb Scene. With her gestures and postures limited by Wilson, she uses her expressive face to assist her in creating an emotional heroine. I think she, not Wilson, is the best reason to consider this DVD. As Amneris, Ildiko Komlosi is almost as good. She throws her voice around excitingly in the Judgment Scene – one of the few times that this production is "interrupted" by applause! Mark Doss's Amonasro and Orlin Anastassov's Ramfis are on the light side – Doss is covered by the orchestra in the Nile Scene – but attractive. The only real debit is Marco Berti's Radamès. This singer has little stage presence, maintaining the same stoic facial expression for almost the entire opera. He also sings under pitch frequently, and is too casual about rhythms. When on the note, he has a big, exciting sound, but for the most part, his Radamès simply does not work. Conductor Kazushi Ono gets the evening's biggest applause, and indeed, he conducts the score sensitively, and with a lot of attention to detail. He's an extremely vocal conductor, however, and there are points during the performance where his excited snarls from the pit are audible: he out-Toscaninis Toscanini!